I've been driving since I was 18 years old. During this span, I've pretty much had a very few accidents and been a cautious and careful driver. I guess I could say around 3-5 very minor accidents and most of these accidents were not my fault. Earlier this week though, and for the very first time, I had a parking lot accident where I was at fault. And it was in broad daylight. I was trying to turn in to a parking slot and miscalculated that I could park in one turn without maneuvering. Unfortunately, I bumped the left car in the rear. When I realized I bumped the car, I was in shock. I immediately put the car in reverse and while pretending that I didn't know what just happened, parked anyway. When I turned off the engine, I looked for any witnesses. I saw a bunch of schoolgirls hanging around Starbucks just across the slot where I parked but didn't seem to notice. I got down from the car and without suspiciously facing the bump, I tried to view it from my rightmost eye view. There was no dent. I only saw a 4 inch red line which obviously came from my car. To make things worse, the car I scratched was white. So it stuck out like a wrong answer marked with a red ballpen in a test paper. I got a white scratch too but didn't mind since I was the one at fault. I was supposed to photocopy some documents and hang around a bit but because I wanted to move my car away from the parking lot, I was in and out of the mall in less than 5 minutes. When I got back, the car was still there. I immediately left. I know it was the wrong thing to do. But since it was my first time, I really didn't know what to do. Should I have waited for the owner to arrive ? What if he was going to take a while ? What if he would charge me an arm and a leg for a small paint scratch ? And so I did the only thing I could think of... leave. The owner of the white car, my license plate is.... *C*2** ... you wouldn't think I'd actually leave my license plate here would you ? A few days ago, I parked in basement parking area of a mall. When I got back, I didn't realize that the guard placed a "No Entry" sign stupidly close to the rear of my car that it was inevitable I would hit it. And I totally didn't notice the sign since it wasn't there when I parked. 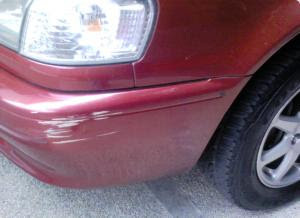 And so when I backed up, I hit the post from the rear and it left me with a 5 inch dotted yellow line on my bumper. I couldn't argue with the No Entry sign even if I wanted to... it wouldn't talk back. Ok, I guess I deserved that. Two accidents in a week is a huge deal for me considering my track record. I guess I have to take care more.